Large format printer (LFP) shipments declined by less than 1 per cent year over year in the first quarter of 2015 (1Q15) while revenue declined by almost 3 per cent, according to new data from IDC. “The first quarter got the year off to a strong start with key wide format printing technologies like Latex, UV, and Eco-solvent inkjet showing nice growth overall,” says Phuong Hang, Program Director, Worldwide Large Format Printer Tracker, IDC. “Latex really stood out in the quarter with shipments up over 55 per cent compared to the first quarter of last year. The wide format CAD/Technical printer market segment was a bit soft in 1Q15, with shipments down 1.2 per cent from the first quarter of 2014. Also, the decline in toner-based printers continued, with toner-based shipments down 14 per cent. Inkjet printer shipments in the CAD/Technical segment grew slightly (less than 1 per cent) when compared to Q1 2014. Across all technologies, wide format graphics printer shipments were nearly unchanged, but because the mix is changing towards more productive Latex and UV-curable engines, printer revenue increased more than $5 million in 1Q15. HP is the top supplier of wide format digital printing systems worldwide. “The combination of strength in the CAD/technical market, its dominance in the burgeoning Latex category, and a competitive position in the UV market give HP the top position overall,” Hang claims. Canon maintained its strong number 2 position among wide format printer manufacturers with market share of 21 per cent when Canon and Canon-Oce shipments are combined. 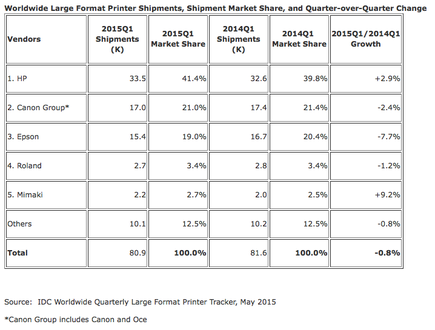 In addition, Epson maintained its position as the number 3 worldwide supplier to the wide format digital printer market. Hang says Epson is seeing “nice growth” in the dye-sublimation and technical printers, and has re-launched its eco-solvent inkjet printer units this spring. Roland is the fourth-rated supplier of wide format printers worldwide based on its strength in the eco-solvent market and growing presence in UV and dye-sublimation. Mimaki has grown to become the fifth largest supplier of wide format printing systems worldwide, surpassing Ricoh, which saw a decline in its wide format toner-based printer shipments. Regionally speaking, shipments in the Asia/Pacific region were soft in 1Q15, with shipments about 1000 units lower than in the first quarter of 2014 as graphics providers continue a shift toward higher value global brands of UV-curable inkjet printers. Lower shipments in Asia/Pacific were offset somewhat by higher shipments in North America and Western Europe. 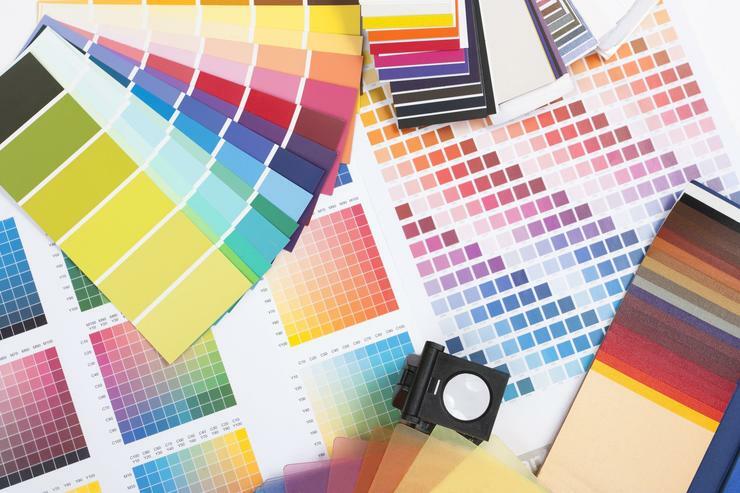 There were also share changes in the eco-solvent market where Mimaki has grown largely due to aggressive price promotion and the updating of core wide format models.